Micșorează scrisul Mărește scrisul Schimbă contrastul Help? The County Public Service Salvamont Vrancea coordinates from an administrative and organizational point of view the activity of county’s mountain rescue, coordinates and watches over the activity of arrangement, maintenance and rehabilitation of touristic routes, answers to the emergency calls, ensures the permanency at the Salvamont centers, organizes the activity of professional training of the county’s mountain rescuers. In 2010, further to a Decision of Vrancea County Council, and having as basis the Governmental Decision 77/2003 regarding the creation of certain measures for preventing the mountain accidents and organizing rescue activities in the mountains, was created the County Public Service Salvamont Vrancea, measure that was necessary for ensuring optimal conditions for developing the mountain tourism in Vrancea County. Being famous for their wilderness, Vrancea Mountains are included in the Curvature Carpathians group, belonging to the Oriental Carpathians, together with Bretcului and Buzaului Mountains. Having an area of almost 1500 sqkm and an altimetry average of 1500 m, with a maximum in Goru Peak 1785 meters, they are a destination that is more and more searched by tourists, especially after upgrading the access ways from the area. The importance of the area is confirmed also by the creation of almost 40% from the county’s mountain surface of the Natural Park Putna Vrancea, with a total of 38.204 hectares including six protected areas. Tisita Gauges and Putna Waterfalls attract every year tens of thousands of tourists, but Vrancea Mountains mean much more. A network of 16 marked touristic routes that sum up 225 km, offer the access to other beauties from the area: Goru Peak, Pietrosu Peak, Dealul Negru, Coza Peak, Black Lake or Caldarile Zabalei are just few of them. Starting with 2016, the European route E8 with a length of 4400 km, that crosses România from North to South, travel 67 km trough Vrancea Mountains, this being another recognition of the value given to this area. The first arrangements of the touristic routes have been done starting with the end of the 70s, within the action “Carpathian’s Assault”, afterwards in successive stages they have been maintained constantly till the 90s when big part of them have been practically abandoned. Thus, in the first years from the creation of the County Public Service Salvamont Vrancea, the measure of remaking the touristic infrastructure (markings and indicators) have become absolute priority. The purpose being the creation of safe conditions for the tourists’ walking as well as attracting new ones that could boost the development of the area. With the support of hundreds of volunteers from all around the country and under the coordination of Salvamont Vrancea, all the routes have been remade in only two years. Once re-established the safety on the paths, it was passed to a new stage: encouraging the tourists to visit the area and also educative, informing and accidents prevention actions have been organized. The entire activity from the creation till nowadays has been exclusively supported by volunteer rescuers. Starting with November 2017 the activity of mountain rescue has been completely reorganized. Nowadays in Vrancea county’s mountain area acts Salvamon Vrancea Formation with employed and qualified personnel. 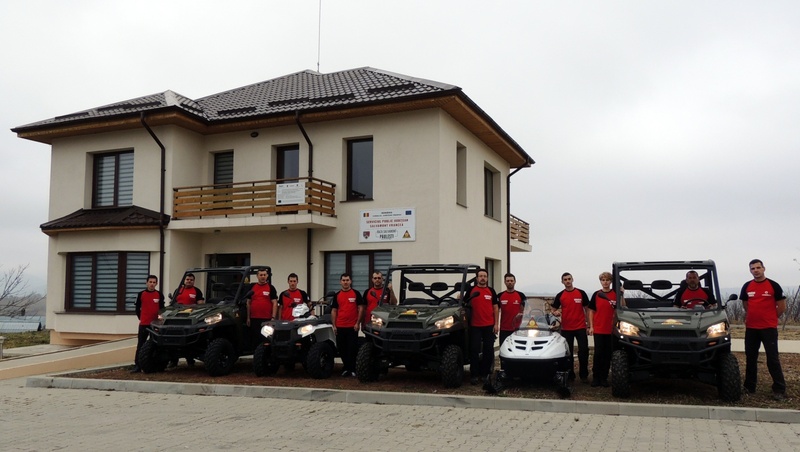 Ten rescuers are developing their activity in the three rescuing centres from Nistorești, Soveja and Păulești, where is located also the coordination centre and the Central station Salvamont Vrancea. All the centres are nowadays fully equipped with machinery and equipment that ensure the efficiency, the rapidity and the safety in function of the service. In the same time, also for supporting the tourists was created the Local Public Service Salvamont Odobești that will take over part of the rescuing responsibilities in the area Măgura Odobeștilor, a destination which is very much frequented lately. Whatever the situation, for an advice, an information or for help, Salvamont structures are and will be in your service, trying to offer safety on mountain climbing. With a nucleus of heart-warming people, dedicated to the noble job that they have chosen, with an organization that is better every day and an appropriate material base, with courageous plans for developing their activity on modern principles, with the important support of the county and local councils, we are sure that, in Romania’s Mountains, the activity of mountain rescuing can be developed really “at height”. Fill in the data of the request in the form below. The fields marked with * are compulsory. I have read and agreed to the collection and processing of personal data.. Copyright © 2018 Vrancea County Council. All rights reserved.